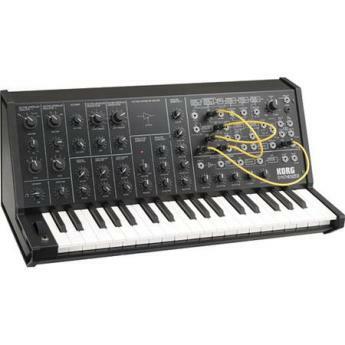 With its combination of immediacy and enigma-like depths to be explored, the Korg MS-20 Mini wins on all counts. The MS20 Mini makes no pretence of innovation, it's simply an amazing recreation of the original MS20, albeit with miniature keys that will force many players into using it as a MIDI module. Notwithstanding some small differences, it's an MS20. Really!, The final signal is cleaner than the original's., You can sequence it from modern systems and play it from full-sized keyboards., The price. This is vintage analogue made affordable. Its mini keyboard means that many players will have to use it as a module., Some aspects are not identical with my MS20, perhaps due to calibration errors., The 3.5mm sockets are not as reliable as quarter-inch sockets., It uses an external power supply. Wonderful experience great product... A very caring and concerned group of people at Sweetwater... I have my own IT guy Jason... He emails me; he calls me to check up on me to insure my complete satisfaction.... A great company to do business with..
Jose did a great job getting this out the door when I ordered it on a Thursday and I actually received it on Saturday which was a nice surprise. First off, the quality appears to be really good. I am not musically inclined with instruments in general. This synthesizer is the best you can get for the prize. I've been using it non-stop, creating sounds for my music and I absolutely love it. Highly recommend it. I can't speak highly enough about this synthesizer. Its just amazing how I can just get lost for hours coming up with my own patches. Its analog bliss! I spend hours designing sounds. And when I'm not playing it, I daydream about playing it. I read a lot of reviews, watched a lot of videos, played around with the MS20 app on iPad, and just plain lusted after this synth for the past year. None of those prepared me for how awesome it is to own one and play one in real life. This synth is a monster! While I am not fortunate enough to have gotten to play with its bigger brother the original MS-20 I still love this piece to bits! The sounds you can get are amazing. It's been a little under a year since I've had my ms20 mini and all things considered its a great sonic device with a hidden depth I previously hadn't seen. I was a little concerned about how close to the original it would sound, but no worries- it's all there!